Now what do you think about that? You either have to be an old timer around here like me or a CSU student who has experienced the pilgrimage. If your curiosity starts to rise, call me and I’ll give you all the information on this not so well kept secret. The Town of Severance is located near all the bigger towns in Northern Colorado such as Windsor, Fort Collins, and Loveland. It has a very diverse population, including a strong agricultural community and the new folks living in the modern subdivisions in the area. In fact, Severance is one of the fastest growing cities in the area sporting over 500% growth since the 1990’s. This community centered city is focusing on the future without forgetting their strong past. 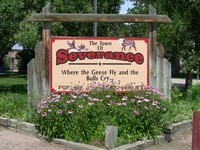 The Town Center has not changed much, the Welcome Sign with its painted bull, flying geese and the motto, "The Town of Severance - Where the Geese Fly and the Bulls Cry' still welcomes residents and sparks the curiosity of guests. Despite its growth, Severance remains small and quiet, yet close to all the "big town amenities” that might draw you out of your home for one kind of adventure or another. The city maintains five wonderful parks, and the surrounding areas are well known by hunters for plentiful waterfowl. While, many residents work in nearby communities and enjoy the short commute to their homes in this peaceful town, growth has brought with it new opportunities and increased economic opportunities. As the area continues to grow, more companies and businesses are sure to move in and provide even more jobs. The Latest Info on the Severance Real Estate Market is Here! Click on graph above for an interactive market real estate report for Severance. The great news is that even though the market is strong, there are a good number of new homes and some condos for sale that are priced better than most other real estate in Northern Colorado cities. As the city grows, demand will rise and prices should go up, making this an excellent time to buy. This is just one of the many great places in Northern Colorado to call home. If you are interested in surrounding towns or are just plain curious about the Welcome Sign, please give me a call at 970-412-1657.